This week on Lake Okeechobee winds have been from the south to south west from 5-15 mph and the water temp has gotten up to 93 degrees with the water level still rising. Sounds fun, but it is not that bad. They are eating spinnerbaits and swim jigs in the morning pretty good. By 8:00 I have been flipping the outside edge line with a jig or worm. Move around and you will get a couple more bites. 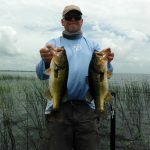 You can check the water level at www.okeechobeejust4bass.com.